If you’re like hundreds of millions of people around the world, you probably spend several hours a day sitting. You know it’s not healthy, and you may have even suffered back problems because of it. Maybe you’ve been proactive, and invested in a high quality ergonomic chair. That’s a great start, but the reality is that even the best ergonomic chairs on the market today are only meant to be used for short term stints of sitting. Unfortunately, that just doesn’t reflect the reality of the vast majority of office-based jobs, which see you sitting for six, eight, or even ten or more hours a day, and that’s not counting the time you spend sitting during the commute to and from work, at lunch, or at the dinner table, and during the downtime when you’re relaxing in the evenings. In fact, an increasing number of people in developed countries find themselves in a seated position for nearly 90% of their waking hours. That’s crazy, and it’s got serious long term implications for your health. While it’s true that there are some exercises you can perform from your chair, that much sitting is bound to have repercussions, and the first place you’re likely to feel them is in your aching back. Of course, it doesn’t stop there, poor posture can lead to chronic neck and shoulder pain and migraines as well. There’s good news though. Designers have been hard at work coming up with new seating solutions that are specifically designed to address all of these issues. You might raise a skeptical eyebrow at spending this kind of money for what appears to be a stool, but the Bouy device is a whole lot more than a simple stool. It comes in six different colors, can adjust up or down by five and a half inches, can swivel, and has a spring in the center, allowing it to “wobble.” You can lean forward or backward up to twelve degrees, adjusting your position to taste. Even if you sit in an ergonomic office chair, your body tends to adopt a slumped “C” shape after a while. Shoulders forward and head down. This stool forces you to adopt better posture, but be warned, you will undergo an adjustment period, during which time your back will be protesting because it’s not used to the strain of sitting properly! The Ballo Stool is functionally similar to the Buoy, and similarly priced, but has a very different aesthetic. It has all the same basic advantages as the Buo﻿y, and should be considered a comparable product. Rounding out our collection of stool-style seating is the Swopper Stool. It’s far and away the most expensive option in its class, but this is a case of getting what you pay for. It’s height adjustable, and the central (height adjusting) piston is a large spring, that allows for both swiveling and bending flexing, while ensuring spinal stabilization. It’s also surprisingly comfortable, and you may even forget the fact that you’re sitting on a stool, rather than in a chair. That’s a neat trick, and it makes the Swopper well worth the extra money you’ll spend on it. 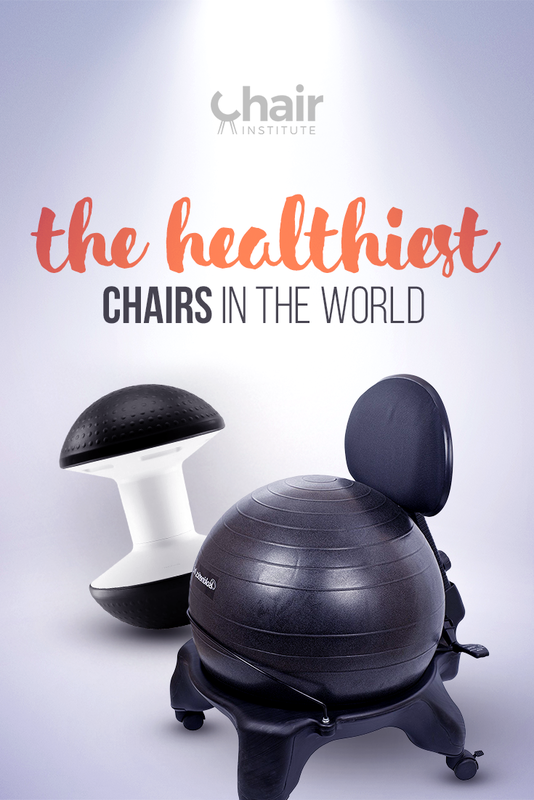 While Ongo exercise ball chair might look similar to the Ballo and Buoy, it’s a functionally different design, incorporating the increasingly popular exercise ball seating into a stool design. It offers the same advantages as the two we’ve mentioned so far, but comes with the added advantages of exercise ball seating. It will help keep your posture correct, and make you much more mindful about how you’re sitting. It will literally keep you on your toes, which is a very good thing! The Kn﻿eeling Posture Chai﻿r is a lot more comfortable than it looks like it would be, and has the advantage of being a relatively low-cost option, too! It offers most of the comfort advantages of an ergonomic chair (minus back support), with the posture advantages of the stools we’ve talked about before, and provides much greater stability, so you don’t have to be quite as mindful of how you’re sitting. The great thing about Isokinetics Exercise Ball Office Chair is the fact that it combines all the best features of an ergonomic office chair with exercise ball seating, so you get comfort (including back support), plus the posture promotion of the exercise ball. They look a little strange when compared to a “regular” office chair, but don’t let that dissuade you! These chairs are serious business, and will help minimize back strain﻿﻿. This looks more like a piece of exercise equipment, and the Focal-Upright Locus Seat certainly doesn’t look comfortable, but appearances can be deceiving. Not only is this chair surprisingly comfortable, but since it’s a “standing/sitting” chair, it actually helps your whole body, optimizing posture and preventing your legs from suffering decreased blood flow and c﻿﻿ramping due to extended periods of time seated. A splendid option, and well worth considering. The Core Chair has been scientifically designed, and is one part seating solution, and one part exercise device. 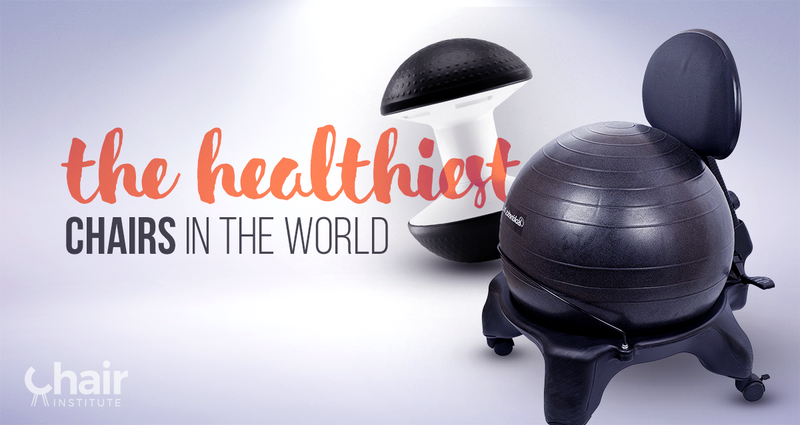 It has been specifically engineered to provide comfortable seating while forcing you to exercise your core. While it won’t give you six-pack abs by itself, it will certainly go a long way, and what could be better than staying comfortable, being productive and getting low impact exercise? We’ve saved the best for last. These specially designed chairs come to us from Europe, are far and away the most expensive option here, but provide all the great posture and comfort benefits we’ve talked about in every model we’ve mentioned thus far, and presented in a visually appealing design that looks a lot like the office chairs you’re used to seeing. If you’re looking for the ultimate in comfort, but don’t want your new chair to stick out like the proverbial sore thumb, then the Spinalis Chairs are without a doubt, what you’ve been looking for. Best of all, they come in a variety of sizes, shapes and styles, from the Hacker, which is their more modestly priced best seller, designed for people of average build, to the Spider, specifically designed for big and tall folks, to the Pilot, which is their luxury option. Lots of choices, styles, and colors to choose from, and the perfect blend of form and function. Not to be missed. You’ve probably heard of the IoT – the Internet of Things, a growing legion of “smart” objects connected to the internet. Well, the “Stir” is a smart desk. It monitors how much time you’ve spent sitting, and sends you a reminder when it’s time to stand up and move around for a bit. It even raises itself up to a height you pre-set when it’s time to stand for a while, then automatically lowers to “seating” height when it’s time to go back to that. A simple, hands-free way to make sure you’re not chained to your chair for too long a period of time, and an excellent companion to any of the chairs we’ve talked about so far. This is ideal for people who work from home, because if you do, you have the space to have two desks, a standing one like this, and a regular one, utilizing one of the seating options we’ve covered here. The ThermoDesk is a great option because you can get work done and get some exercise too, thanks to the built-in treadmill. If you combine this idea with a regular desk and a core chair, you’ll be getting plenty of exercise throughout the day, without changing a thing about your routine. Now that’s win-win! Sitting has been described as the new smoking. We do too much of it, and it’s killing our bodies. Any of the seating options we’ve talked about in this piece will serve you well and do wonders for your back. If you combine a few of them, say, the Stir Smart Desk, with a Core Chair, or a Spinalis, and a standing desk like Thermodesk, you’ll do wonders for your overall level of health, and your back will thank you for it. If you want to really take it to the next level, add a massage chair to your wish list and you’ll have everything you need for optimal health and wellness. What Is the Difference Between A Wheelchair And Transport Chair?